Blissful bairn bath » Harrumph! 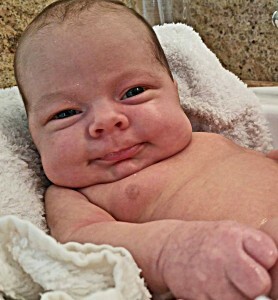 At four weeks, granddaughter Ada loved her first bath. That’s remarkable in at last one way. Her father was terrified. Other than brief-lived jaundice (into the window in the woven carrier per the pediatrician’s orders! ), his early months were happy and curious. In fact, the recorded moment of birth in NY is when the crew (I in this case) cut the umbilical cord. Even before that, neonate Aaron looked about with insight and extrospection. However, laving was different. Sponge bath, in the baby tub or the roomy stainless sink…the method and locale were not relevant. My first-born wanted no part of water and bathing. Granted, this peculiarity astonished me by background. I have always been a water guy. I still swim in the Y pool many times each week. I was a water safety instructor and summer swim-team coach, and lifeguard and team swimmer in high-school and college. I shower and bathe one, two or three times a day. I love water and never feel more graceful, happy and meditative. How could this tragedy occur with my son? I had an aide though. I worked in a smallish publishing group, maybe 30 folk, the count of an elementary classroom. One was a Dutch fellow also in his late 20s or early 30s. I’m not sure his nationality played into it, although the sophistication and open-mindedness may have been factors. I asked around in the group about whether anyone had children who were or had been afraid of bathing. He was quick to teach. It makes perfect sense to me that I could connect with him by bathing him while I chatted and grinned and he babbled. Except, he screamed and fought. I explained that I showered and shaved in the morning before heading to American Management Association. He fairly snorted and said that this was about my son and not about me. It wasn’t going to hurt me to get wet again and that if my son was frightened, being in the tub with his father was all he would need. I’d run water into the adult tub, undress us both, and climb in with him. He’d cling to me and sometimes lie back on my hands as I washed his hair. We’d chat and laugh. We’d reconnect after my day away. Perhaps as important, my wife and his mother has time to herself after 10 or so hours of intensity. It’s nice that Ada likes her bath. Yet, I have to wonder what my son and daughter-in-law might be missing.